The U.N. claims that guns used in armed conflicts cause 300,000 deaths worldwide every year, an inordinate number of which are the result of internal civil strife within individual nations. The solution proposed by transnationalists to keep rebels from getting guns is to make the global pool of weapons smaller through government action. According to recent deliberations regarding the treaty, signatory countries would be required to "prevent, combat and eradicate" various classes of guns to undermine "the illicit trade in small arms." Such a plan would necessarily lead to confiscation of personal firearms. 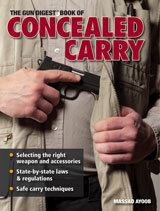 The Gun Digest Book of Concealed Carry is a must-read for anyone interested in concealed carry of a handgun. Learn more. This may seem like a reasonable solution to governments that don’t trust their citizens, but it represents a dangerous disregard for the safety and freedom of everybody. First of all, not all insurgencies are bad. As U.S. history shows, one way to get rid of a despotic regime is to rise up against it. That threat is why authoritarian regimes such as Syria, Cuba, Rwanda, Vietnam, Zimbabwe and Sierra Leone endorse gun control. Read more.